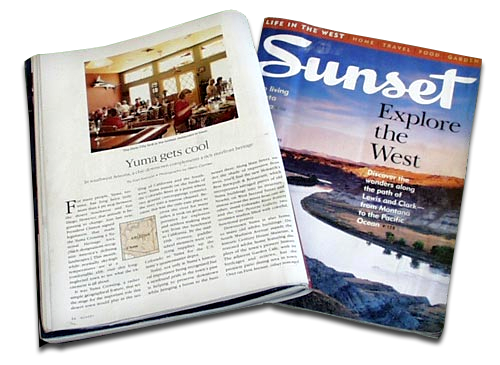 Sunset Magazine - "Yuma Gets Cool"
"Innovative seafood in a stylish setting." "Yuma gets cool" ... "In Southwest Arizona, a chic downtown complements a rich riverfront heritage" ... "Over on First Avenue, other restored adobe buildings house interesting shops. And just a few blocks away, Yuma's new restaurant, the River City Grill, gives a nod - at least in name - to the town's historic ties to the Colorado River." 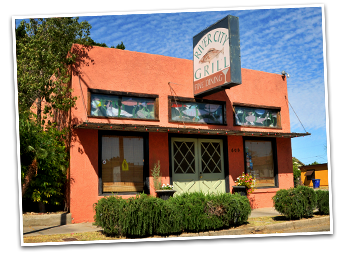 The Los Angeles Times - Readers recommend: River City Grill in Yuma, Ariz. In Yuma, Ariz., we discovered a delicious find: curried mussels with lobster ravioli, pistachio-crusted salmon, rack of lamb, even mustard-crusted tofu with spinach ravioli. So many enticing choices. Open Mondays-Fridays for lunch, every day for dinner. It's been said that this hip but tiny restaurant, housed in a 90-year-old building and featured in Architectural Digest, puts the yum in Yuma. Well said. The menu, which manages some serious globe-hopping, offers everything from Vietnamese spring rolls and Jamaican jerked chicken to seafood gumbo and wild salmon with raspberry chipotle sauce. "Low in fat, rich in flavor," that's the mantra here, where regulars who prefer more breathing room head for one of two spacious, maturely landscaped patios. Congratulations on winning a TripAdvisor Certificate of Excellence! We take great pride in our talented staff and hope your experience with us is a happy one.